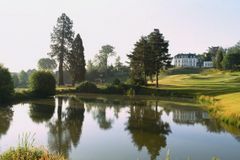 Golf de Béthemont is located just 20 minutes from the centre of Paris, and is thus far the only course in France to have been designed by 2 times Masters Champion Bernhard Langer. Golf de Béthemont promises to provide an exciting and new experience for even the most travelled golf enthusiasts. The 6,600 yard course has a par-72 layout and is situated in an area which is both hilly and abundant with oak trees, with great views from almost every tee and green. There are a number of sharp dogleg holes, water hazards, and strategically positioned bunkers so keeping the ball on the straight and narrow is a priority. The course can be quite technical and often difficult to read at times, so make sure you invest in a stroke-saver before you head out. The clubhouse is able to boast the terrific “Le Jeanne d’Arc” restaurant which offers great views out over the gorgeous golf course. The setting is both comfortable and relaxing, decorated in typical French style and serving up delicious traditional French cuisine. There is also a bar next to the restaurant which overlooks the green of the 18th hole – the perfect place to have a post-round drink.